We no longer own at this resort. 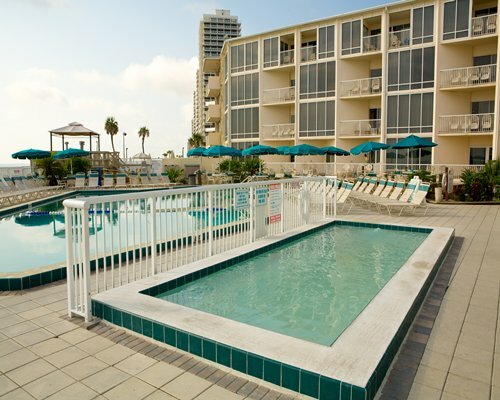 Please contact us to check inventory for your weekly Daytona Beach rentals. Our guests are like family at the Ocean East Resort Club. Escape winter’s chill in luxury, in our fully decorated and furnished lodging accommodations. And it’s more than a room — you will also enjoy all the amenities of an exclusive resort — hot tub, pools, saunas, exercise room, recreation room, children’s activities, security and two onsite restaurants. Plus, with Daytona Beach nearby, you’ll experience stock car racing at the World’s Center of Racing, Adventure Landing, LPGA golf tournaments, deep sea fishing, dog racing, golf, sailing, shopping, riverboat cruises, concerts and spectator events at the Ocean Center and the Peabody Auditorium, including the London Symphony Orchestra. Located on the Atlantic Ocean in Ormond Beach, Ocean East is a perfect place to stay and play, facilitating your experience of all of central Florida’s attractions. St. Augustine- the oldest city in the United States, is just an hour north. Within 50 miles west are day trips to Disney World, Animal Kingdom, EPCOT, Universal Studios and Sea World. And don’t miss Kennedy Space Center, less than 1 1/2 hours to the south. The beachfront one bedroom condo vacation rental sleeps 4 people, and includes a full kitchen, two color cable TV’s, DVD player, 1 bathroom with jetted jacuzzi tub, queen bed, queen sofabed, and a unit safe.